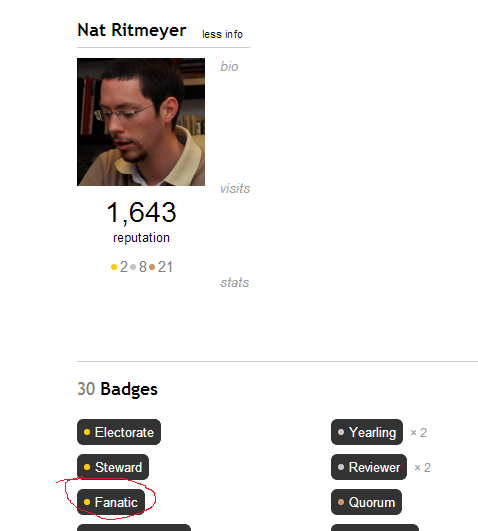 Just lost my 'fanatic' badge and earned 35 points? Could ThePowersThatBe please fix this up and give me my gold badge back? This was indeed due to the account merge. The merge process was not migrating badges (as we have some automation around that already), however, this is disabled for some expensive queries, including the fanatic badge one. Going forwards, such badges will be moved to the merge target. We have now also ran the queries backfilling such issues as your own. Not the answer you're looking for? Browse other questions tagged support bug status-completed badges user-accounts . Where did my Unsung Hero badge go? Increasing effort for “Visiting the site each day”… Participation Badges?